Loved by Guests – thanks hotels.com! We’d like to say a big “Thank you!” to all our hotels.com guests, who left us reviews in the past year! Thanks to your great feedback, we’ve recently been awarded a #LovedByGuests certificate from the online travel website! The awards honour hotels that consistently receive top ratings from guests. We’re always happy to receive guest feedback, whether it’s on a booking website or on TripAdvisor. Here’s to another year of great service and great guests! We’re very please to have been awarded a TripAdvisor Certificate of Excellence again this year. We have been recognised by our TripAdvisor reviewers for providing outstanding service every single year since 2013. Have a look at the awards page on our website here to find out more about the various awards we’ve won over the years. A big thank you to all our guests, who left us reviews on TripAdvisor over the past year! Awards, birthdays, and guest comments! A little while ago, our partners from Lastminute.com came to see us and brought us a nice surprise: A special plaque of appreciation for our dedication and longstanding partnership. We’re very proud to have had a stellar year with Lastminute.com and would like to say a big “Thank you!” to all our Lastminute.com guests and, of course, our teams who look after them. If you’re in Dubai this weekend, do join us to congratulate our friends from McGettigan’s JLT on their 5th birthday! Yes, it’s really only been five years that we opened McGettigan’s Pub in our hotel, but what a journey it has been! These days, you can find McGettigan’s in several locations in Dubai, Abu Dhabi, Ireland, Singapore, New York, and – shortly – also in London. The next three days, though, are all about the JLT pub, where everything started. McGettigan’s has put together a fabulous lineup of offers and events – check them out here. During the past weeks, we’ve also received more guest comments via our Golden Book in the hotel lobby. Here are a few, but you can find more on our dedicated Pinterest board here. Start you weekend the Bonnington way! Join us at the Bonnington Jumeirah Lakes Towers in the heart of Dubai’s thriving JLT community for a truly social dining experience. 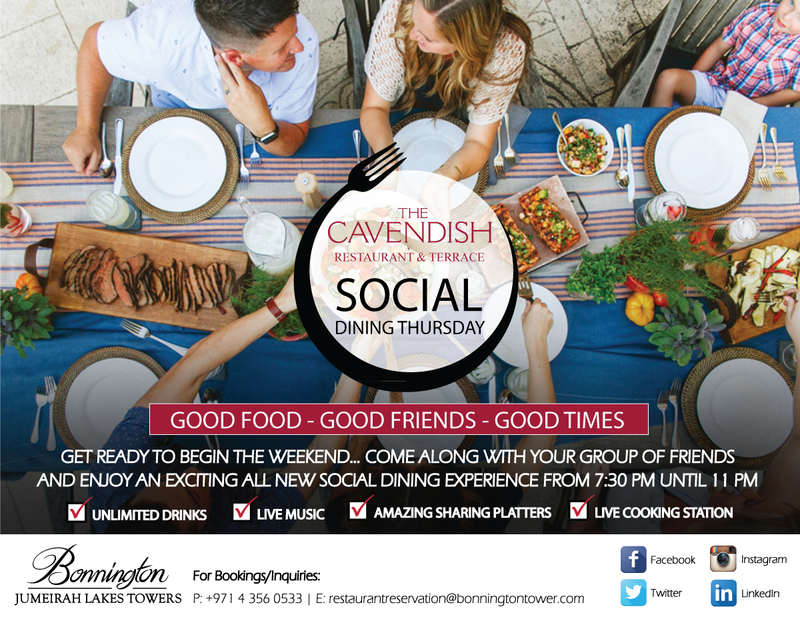 Every Thursday from 7.30 p.m. – 11 p.m., gather your friends and colleagues at the Cavendish Restaurant & Terrace and experience Social Dining Thursdays, a great new casual dining concept with unlimited beverages, tasty sharing platters, and live music. Enjoy an al-fresco evening on the Cavendish Terrace or meet at a table in the stylish Cavendish Restaurant. Indoors or outdoors, you’ll find big social dining fun at a small all-inclusive price, great service, and freshly prepared innovative European cuisine. We bring our famous “It’s all about you” service, your bring your friends. Together we’ll kick off the weekend and let the stresses of the workweek fade away over great food and great company. Come as you are! Our talented chefs will cook up a storm and present you with a variety of their best creations on sharing platters. We’ve got platters full of meat and platters for vegetarians – just take your pick, tell us what you’d like to drink, and let us do all the work while you chat to your friends and colleagues. Stay for an hour or for the entire evening – social dining Thursdays are all-inclusive, so you’ll always know exactly how much you’ll spend! Share your Bonnington Thursdays: #SocialDiningJLT . You can also read the McGettigan’s blog here and get more info on their festive offers. October’s here! So are our offers! Good bye September! Hello October! We’re eagerly awaiting the cooler autumn and winter temperatures in Dubai! Our local community, Jumeirah Lakes Towers, will play host to some great events over the coming weeks and we’ll showcase them in an upcoming blog post. Right now, we thought, we’d bring you up-to-date with our October offers. 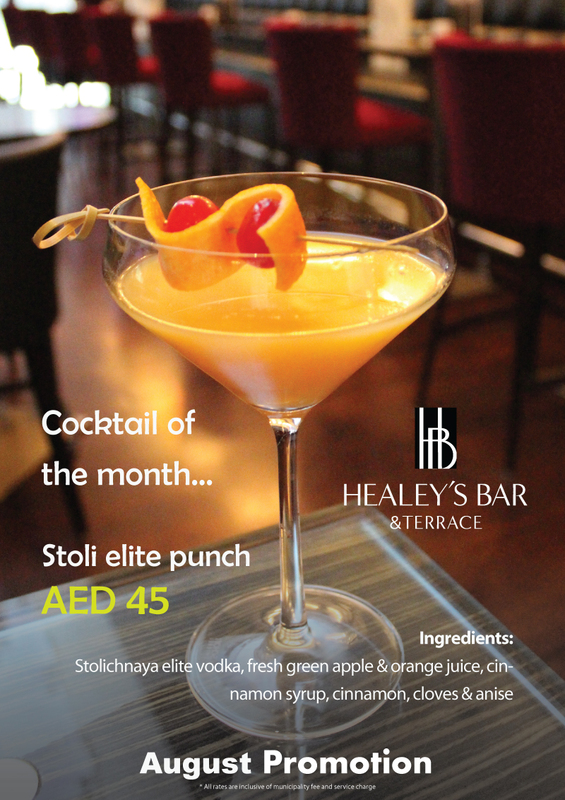 Healey’s Bar and Terrace remains the place to be seen in JLT, so why not pop in for a masterly mixed cocktail, a fine glass of wine, some great snacks, or a shisha on the terrace? Need an additional excuse? How about our cocktail of the month? In our Author’s Lounge things aren’t just about tea, coffee, and great pastries! In October, you can also board a Belgian Beer Flight and try three great Belgian beers for a very special price! Also visit our Pinterest board for more great offers! Thank you, Hotels.com! Plus, August offers & news from the Bonnington! We’re delighted to have been awarded a Hotels.com Certificate of Recognition! The certificate is given to properties which consistently deliver outstanding service and offer a memorable guest experience. Thanks to everybody who rated us on Hotels.com! Happy Ramadan! Are you ready for Eid yet? Ramadan Kareem to all our guests, associates, visitors, suppliers, neighbours, and friends! We hope you’re Ramadan has been going splendidly so far! We’ve certainly enjoyed all our iftars so far and we’ve got some great reviews on TripAdvisor for them. Check them out by clicking here. Thanks to all diners who took the time to review us! TripAdvisor Awards and even a Hall of Fame entry! We’re delighted to have been awarded ‪TripAdvisor‬ Certificates of Excellence for 2015 for our hotel, the ‪Cavendish Restaurant‬, and ‪Healey’s Bar‬ & Terrace! What’s more, because the hotel has won a Certificate of Excellence every year for the past 5 years, we’ve also been added to the TripAdvisor Hall of Fame! Thanks to all our guests and TripAdvisor reviewers! We really do like guest comments very much and your comments and reviews ensure that we constantly update our products and services. If you’re not on TripAdvisor and you’re staying with us, don’t forget to leave us a comment in our Golden Book at reception! At the Bonnington, every guest is a VIP!